I’ve traveled a lot, and I’ve met all kinds of scammers, but today they got me. You’re walking along the street. Up ahead is a shoe shine guy, with all his kit. Suddenly he walks off, but accidentally drops one of his brushes, without realising. You, being a nice person, pick it up and catch up to him, and give it to him. The shoe shine guy of course is incredibly grateful, and as a gesture of good will offers to shine your shoes for free. In this instance, my wife was wearing dirty boots – accumulated over two weeks of walking the Via di Francesco in Umbria. Oh, she says, I need my boots cleaned. So the shoe shine guy cleans her boots. And then he demands money. I had walked away by this time, and didn’t realise that a financial transaction was in process. 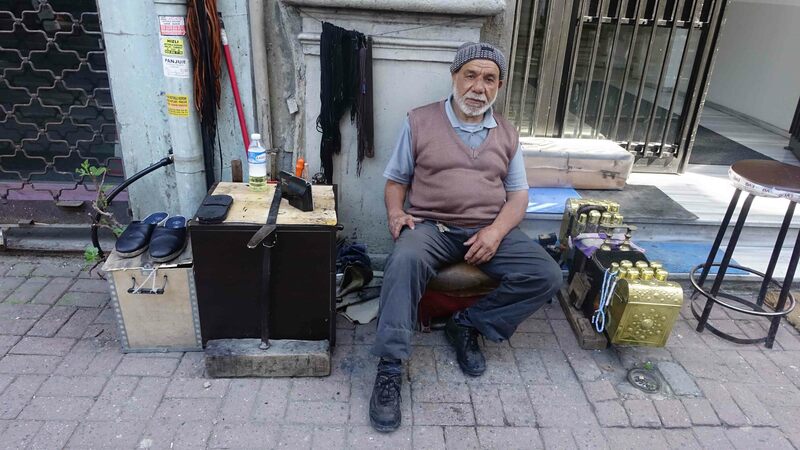 The shoe shine guy was demanding 20 Turkish Lire..
My wife, being a person of purer heart than me, gladly hands over a 20Lr note. I meanwhile wander back, realise what’s happened, realise immediately that the whole thing was a set-up and a scam, and demand the money back. My wife then starts abusing me and telling me I’m heartless, and she would gladly pay 20Lr for her boots to be cleaned. I ask my wife if she knows how much 20Lr is worth in Australian dollars. I ask if she knows how much 20Lr is worth in Euros. I tell her that for $10 Australian, I would not only clean her boots but I would polish her nails and clean her teeth as well. She tells me that I should open my heart and be more generous. Anyway, she said, it wasn’t a scam. Later, as we were walking through a tourist area, the same thing happened. A shoe shine guy accidentally dropped his brush in front of us as he was walking off – without him apparently realising. I stepped over it and yelled out to him: Hey mate, you dropped your brush. You want your shoes shined? You just walked a Camino! You need a refresher course on being a pilgrim and not letting things bother you already? Ha,ha! Ah Lynda, you’re right. Jennifer is way ahead of me in the pilgrim stakes! Thanks for the warning Bill we will be there in a few weeks. It’s evidently a well orchestrated scam now Carol. Mind you, if they shine your shoes you don’t have to pay them!! It’s a very clever piece of psychology, as most scams are. Ultimately it works on your greed – again as most scams do – the notion that you’re going to get some thing of value for nothing. And then it works on your decency, that you should ultimately pay for a service given. It’s very clever! Bill, for someone who has been married for so long and also married to the sweet Jennifer, haven’t you learnt yet to accept that $10 is not worth the argument that you are definitely not going to win. Don’t forget happy wife happy life! Haha yes James, you’re right. Jennifer said that $10 is nothing in the whole scheme of things, and of course she’s right. I just don’t appreciate being taken advantage of – but I do admire the theatre of it all! Can’t you buy a whole new pair of shoes in India for $10?